The People's Guide 2015 32 CalFresh Many people who qualify for CalFresh/Food Stamps don't think they qualify or do not know how to apply. If you or someone in your home needs food, you should apply; everyone deserves to have enough to eat. 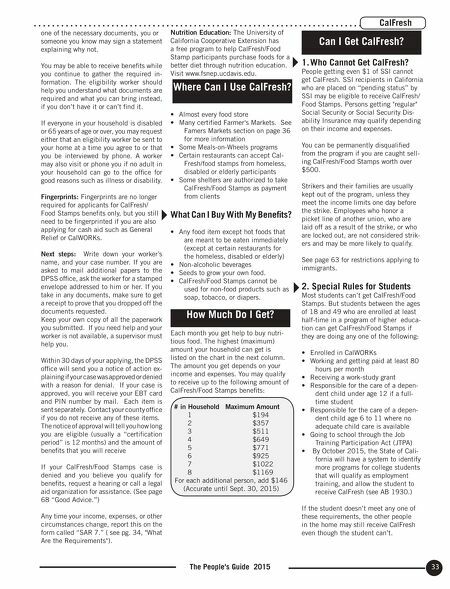 To get CalFresh/Food Stamps, you must be a U.S. citizen or a legal immigrant non-citizen (see page 62 Guide for Non- Citizens). You must also meet income requirements. You don't have to have a home or a place to cook to get CalFresh/ Food Stamps. People receiving SSI do not qualify for CalFresh. There are restrictions also for students and people on strike from their jobs. Beginning April 2015, persons with past drug felonies may qualify if they are complying with parole and probation. (Some may qualify already: call Hunger Action LA (213) 388-8228.) 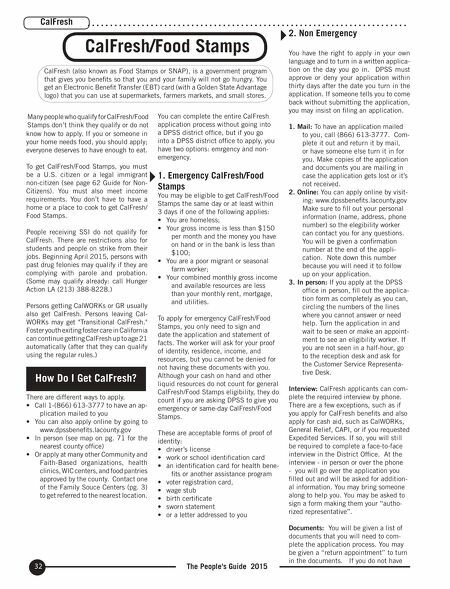 Persons getting CalWORKs or GR usually also get CalFresh. Persons leaving Cal- WORKs may get "Transitional CalFresh." Foster youth exiting foster care in California can continue getting CalFresh up to age 21 automatically (after that they can qualify using the regular rules.) How Do I Get CalFresh? There are different ways to apply. • Call 1-(866) 613-3777 to have an ap- plication mailed to you • You can also apply online by going to www.dpssbenefits.lacounty.gov • In person (see map on pg. 71 for the nearest county office) • Or apply at many other Community and Faith-Based organizations, health clinics, WIC centers, and food pantries approved by the county. Contact one of the Family Souce Centers (pg. 3) to get referred to the nearest location. You can complete the entire CalFresh application process without going into a DPSS district office, but if you go into a DPSS district office to apply, you have two options: emrgency and non- emergency. 1. Emergency CalFresh/Food Stamps You may be eligible to get CalFresh/Food Stamps the same day or at least within 3 days if one of the following applies: • You are homeless; • Your gross income is less than $150 per month and the money you have on hand or in the bank is less than $100; • You are a poor migrant or seasonal farm worker; • Your combined monthly gross income and available resources are less than your monthly rent, mortgage, and utilities. To apply for emergency CalFresh/Food Stamps, you only need to sign and date the application and statement of facts. The worker will ask for your proof of identity, residence, income, and resources, but you cannot be denied for not having these documents with you. Although your cash on hand and other liquid resources do not count for general CalFresh/Food Stamps eligibility, they do count if you are asking DPSS to give you emergency or same-day CalFresh/Food Stamps. These are acceptable forms of proof of identity: • driver's license • work or school identification card • an identification card for health bene- fits or another assistance program • voter registration card, • wage stub • birth certificate • sworn statement • or a letter addressed to you 2. Non Emergency You have the right to apply in your own language and to turn in a written applica- tion on the day you go in. DPSS must approve or deny your application within thirty days after the date you turn in the application. If someone tells you to come back without submitting the application, you may insist on filing an application. 1. Mail: To have an application mailed to you, call (866) 613-3777. Com- plete it out and return it by mail, or have someone else turn it in for you. Make copies of the application and documents you are mailing in case the application gets lost or it's not received. 2. Online: You can apply online by visit- ing: www.dpssbenefits.lacounty.gov Make sure to fill out your personal information (name, address, phone number) so the elegibility worker can contact you for any questions. You will be given a confirmation number at the end of the appli- cation. Note down this number because you will need it to follow up on your application. 3. In person: If you apply at the DPSS office in person, fill out the applica- tion form as completely as you can, circling the numbers of the lines where you cannot answer or need help. Turn the application in and wait to be seen or make an appoint- ment to see an eligibility worker. If you are not seen in a half-hour, go to the reception desk and ask for the Customer Service Representa- tive Desk. Interview: CalFresh applicants can com- plete the required interview by phone. There are a few exceptions, such as if you apply for CalFresh benefits and also apply for cash aid, such as CalWORKs, General Relief, CAPI, or if you requested Expedited Services. If so, you will still be required to complete a face-to-face interview in the District Office. At the interview - in person or over the phone - you will go over the application you filled out and will be asked for addition- al information. You may bring someone along to help you. You may be asked to sign a form making them your "autho- rized representative". Documents: You will be given a list of documents that you will need to com- plete the application process. You may be given a "return appointment" to turn in the documents. If you do not have CalFresh/Food Stamps CalFresh (also known as Food Stamps or SNAP), is a government program that gives you benefits so that you and your family will not go hungry. You get an Electronic Benefit Transfer (EBT) card (with a Golden State Advantage logo) that you can use at supermarkets, farmers markets, and small stores.